The Chamber is committed to our members success and we strive to be a go-to resource and tool box for them and our community to get business done smarter, easier, and more affordably. Below are a number of solution providers that the Chamber Board has chosen and negotiated “deals” with to benefit how you do business. Each offers you a discount to help your bottom-line too. Your feedback is always welcome, and your success stories as well. We are your local Chamber of Commerce… how can we help? Emails. Events. Surveys. They’re all about one thing: Staying connected with your audience. With Constant Contact, you get powerful yet easy-to-use suite to provide your organization all your marketing, event management and online surveying. It is so good, as a Chamber it is what we use. As a Chamber member you can try it for FREE with a 60 day trial account. If you already have an account with constant contact, you can qualify for a Chamber Discount as well. And Constant Contact has video tutorials, templates, online knowledge reference files, and good old fashion call for support/help. This is a unique member benefit program designed to save you time, energy and money – just because you belong. Using the collective buying power of more than 20,000 member businesses statewide, members SAVE has negotiated members-only pricing and secured special offers on products and services member businesses like yours use every day. From office supplies and shipping discounts to fuel price protection and payroll, we offer small businesses savings and deals typically reserved for large companies. ZipMart specializes in providing a “one-stop shop” for individuals and organizations looking to purchase online training courses needed for certification, or to advance employee knowledge in topics such as workplace diversity, ethics, sexual harassment prevention, time management, and conflict resolution. Online training offers companies a cost-effective alternative to sending employees to expensive off-site conferences, giving you the opportunity to learn at their own pace on a wide variety of electronic devices, including tablets and smart phones. As a Chamber Member, you can now signed up for savings at Six Flags! Just log into our Six Flags site to buy tickets with substantial savings off the main gate price. This online benefit program offers not only substantial savings, but allows you to “print and go” so you have your ticket in hand when you get to the park with no waiting in the line to purchase tickets. 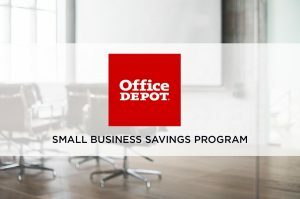 We’re proud to be a part of Office Depot’s Small Business Savings Program, presented by ChamberSolutions and administered by Excelerate America. Tailored to meet the modern needs of small and mid-sized businesses and non-profits, it supports the growth and development of local business communities through fantastic savings both in-store and online, plus preferred customer assistance, access to simplified tech services, and so more.